The final two episodes of this season of DOCTOR WHO — “Heaven Sent” and “Hell Bent” — will run longer than the standard 45-minute episodes in England, with “Hell Bent” adding a whole 20 minutes! “Heaven Sent” will boast about 10 minutes more than usual. BBC America has not released any information about the run times of the final two episodes here in America, where stories are typically trimmed to make room for commercials. “Heaven Sent” will premiere on Nov. 28, and “Hell Bent” wraps up series 9 on Dec. 5. 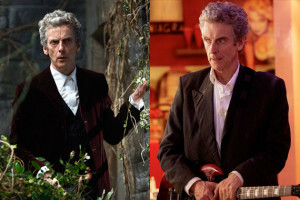 “Hell Bent” will be the longest episode of DOCTOR WHO since Peter Capaldi’s debut story, “Deep Breath,” which ran 76 minutes. Let Matt Smith, the Doctor himself, deliver one last tease about tonight’s DOCTOR WHO season seven finale. Welcome back old friends and enemies! I’m holding out hope that we don’t get the Doctor’s real name; I don’t want that secret uncovered, because the mystery around the central character helps keep him and the show interesting. What do you hope to see in the season-capper? We’re now hours away from the seventh-season finale of DOCTOR WHO, and with an intriguing title like “The Name of the Doctor” how can fans help but be more excited than usual?